Compete in the 5K, enjoy the Fun Run, or just watch the action at this classic St. Augustine race event, now in its 39th year. 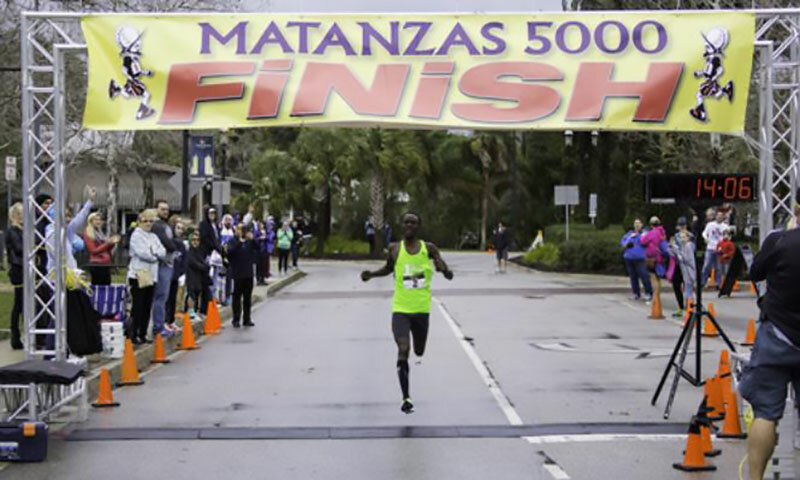 The 39th Annual Matanzas 5K and Fun Run is one of Florida's fastest 5K races on a scenic, certified course through historical St. Augustine. Produced by the Ancient City Road Runners, the event includes a competitive 5K and a Fun Run on Saturday, January 26, 2019, as well as a Runners Expo on both Friday and Saturday, January 25 and 26, 2019. The Runners Expo will be held at the Ketterlinus Elementary School Gym (at 60 Orange St., just behind Francis Field) and will feature sports and fitness vendors. This is also the location for late registrations and race packet pick-ups. On Saturday, January 26, 2019, the race kicks off with the 5K at 8:00 a.m., followed by the Fun Run at 9:15 a.m. Both runs begin at 29 West Castillo Drive This race includes a competitive 5K as well as a fun run that starts after the 5K. Since the race winds through downtown St. Augustine, spectators and those with friends or family running in the race can easily cheer from the sidelines. When: Saturday, January 6, 2019, at 8:00 a.m.
Where: The start line is at 29 West Castillo Drive, between the City Parking Garage and Francis Field. The race runs along the beautiful Matanzas River, goes through the historic district of downtown St. Augustine, and finishes on Castillo Drive. Please visit here to register. Friday, Jan. 25, 2019 / 3:00 to 7:00 p.m.
Saturday, Jan. 26, 2019 / 6:30 to 8:00 a.m. When: Saturday, January 26, 2018, at 9:15 am. Where: This is a one-mile run in historic downtown St. Augustine. Entry Fees: FREE for kids 13 and under. The Fun Run features t-shirts for the first 100 runners, medals for the top three boys and girls, and an award for the school that has the most runners. Fun Run registration is ONLY on the day of the race. This two-day Runners Expo will feature the newest designs in running gear and shoes, as well as the latest developments in sports, fitness and nutrition. When: Friday, January 25, 2019, from 3:00 to 7:00 p.m, and Saturday, January 26, 2019, from 6:30 to 10:00 a.m.
Where: Ketterlinus Elementary School Gym is located at 60 Orange Street, St. Augustine, FL 32084. Admission: The Expo is FREE and open to the public. Proceeds from this run go to benefit St. Johns County high schools and middle schools cross-country programs. Over the last five years of the Matanzas 5K and Fun Run, over $75,000 has been contributed for the student runners! The Awards Ceremony begins at 9:30 a.m. at the Ketterlinus Gym. Parking in the City Downtown Parking Facility is FREE if you arrive inside the garage before 7:00 a.m. on Saturday. After that, the cost is $15 per day. Fun Run FREE. Registration is on day of race.